Boys and girls ages 5-12 are welcome! Join us this summer for one or more 4 or 5-day programs filled with a variety of activities. 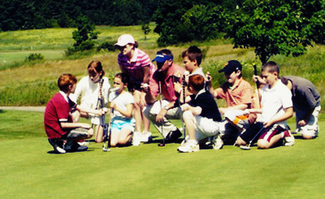 Campers will receive professional golf and tennis instruction. Our PGA Professionals will introduce the game of golf in a fun relaxed atmosphere focusing on the fundamentals of such as full swing, putting, chipping, rules, and etiquette. Tennis instruction will be provided by a tennis professional. The instruction will be given in an enthusiastic, fun, and relaxed environment where campers will learn and practice the fundamentals of the game of tennis. Wear loose comfortable clothing with sneakers. Shirts must have collars, no t-shirts or blue jeans. Lunch will be available for purchase in the deli, and snack will be provided. Please remember to bring golf clubs, tennis racket, bathing suit, and towel. An additional $75 will be charged per child to attend camp on Fridays. May charge to member account or pay with the check on the first day of camp. Due to the popularity of the camps, failure to cancel at least ten days prior to the camp start date will result in a $100.00 cancelation fee. If you are a non-member signing up for a camp you must put down a $100.00 deposit PER camp to reserve your spot. This $100.00 deposit will go towards your total cost of the camp. Checks can be mailed or dropped off at Vermont National Country Club.